Hello ... Hello ... my old friends ... It's great to see you once again! 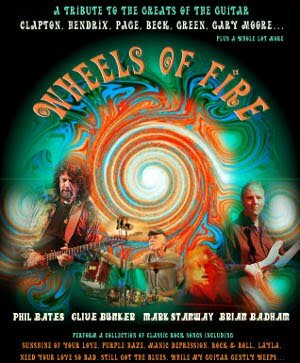 Please be advised that I shall, in all probability, be over at Whitmore Reans Conservative Club in Wolverhampton on Saturday 4th December to once again see and hear Phil Bates' latest project Wheels Of Fire performed with fellow founders Mark Stanway, Clive Bunker and Brian Badhams. Yours Truly KJS is expecting a few friends and work colleagues to be there too. It's a great opportunity for a really good musicfest and it would be nice to make your acquaintance. You simply can't beat live music by talented musicians - especially those of the ELO [and related] kind! On top of that, I'm also hoping to have some more news re: Wheels Of Fire and ELO Beatles Forever [ELOBF] in the near future too. ELO Beatles Forever [ELOBF] recommends Wheels Of Fire to those enlightened folks who enjoy the music of ELO, Jeff Lynne, Roy Wood, The Move, The Idle Race, 'Brum Beat', The Beatles and related artistes. See you there? ELO Beatles & Beyond Forever! Imaginos: What a Wonderful Disc-overy!